We’ve used the i1iSis for chart measurements when building our ICC printer profiles, for some time. Keith reviewed the basic iSis scanner a while ago. X-rite have now released an additional software module that allows for building profiles that compensate for optical brighteners. The OBA compensation charts are now supplied with the iSis, but X-rite were kind enough to send us the kit to try out with our older scanner. Modern papers often come with varying amounts of Optical Brightening Agents or OBAs (aka fluorescent whitening agent or FWA) in their bulk or coating. 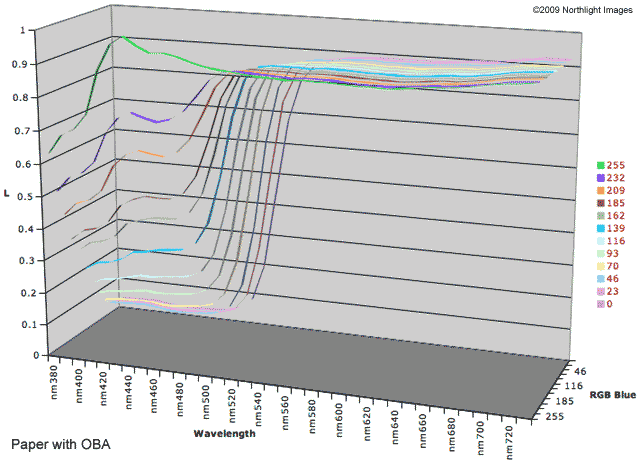 OBAs work by taking non visible short wavelength light (UV) and fluorescing at slightly longer visible wavelengths (blue). If all papers were looked at in a uniform light then there wouldn’t be a problem, but real life lighting conditions vary considerably. In a home lit by tungsten lighting, there is very little (if any) UV present, whilst near a window facing the sky, there is much more. Note that this is not the same as the colour temperature of the lighting which you’d set as a white balance when taking a photo. This variation has the effect of changing the optical properties of the paper, or how it looks. 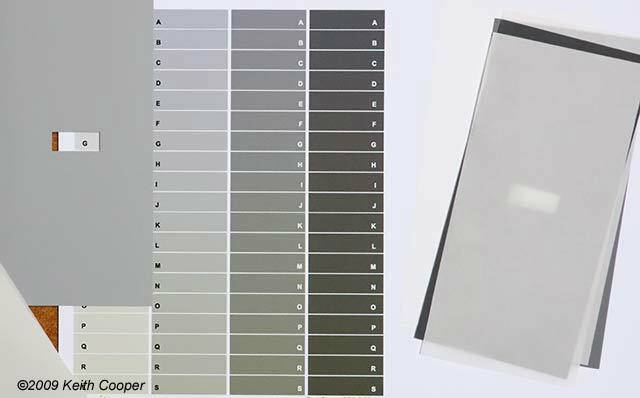 If you apply coloured inks to the paper, then the variation in UV will changes how any prints look. This happens in addition to any change in look due to varying colour temperatures of lighting. The graph below shows the spectral response of a paper I was testing with a lot of OBAs in it. The readings are of a series of coloured patches printed with different intensity yellows. The RGB values run from 255,255,255 (white) through to 255,255,0 (pure yellow). 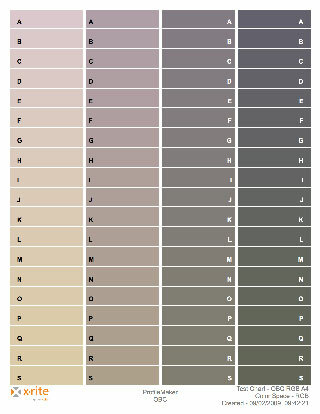 Unfortunately I was unable to get the correct colours from an Excel chart, so you’ll have to look at the key to the right. What is plotted here, is the reflectance (zero to one) in each spectral band measured by my iSis, using its built in UV source and main light. 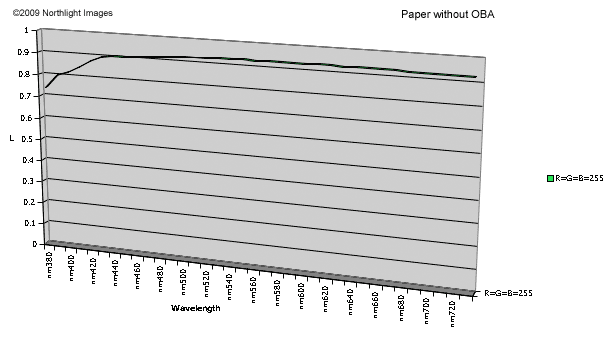 The first green curve shows the response of the plain paper (R=G=B=255). Notice the big bump at ~430nm (in the blue). This is the peak produced by the OBAs in the paper. Compare the graph above with that of a natural white cotton rag paper. For some papers the ‘blue peak’ can cause real problems in creating ICC profiles, since most measurement equipment used has a constant light source. There are various software approaches to dealing with the OBA issues, but they vary considerably in their success. The software also works with the Monaco Profiler application. The process of using the OBC module is quite simple. In the screen shots and pictures below, I’ll show the process in a bit more detail. 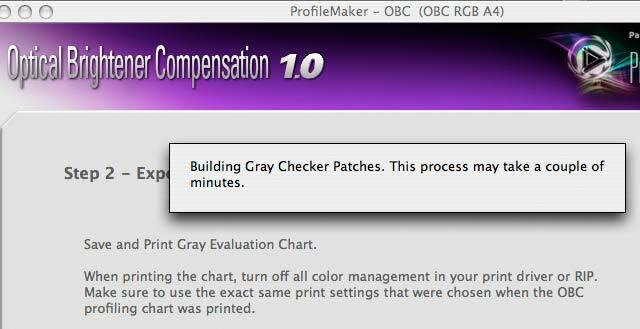 The OBC module detects that I’m using ProfileMaker Pro (PMP) and allows me to go into the OBC software or move on to PMP. As with all charts, print it with all colour management turned off, or your usual profile making settings. The iSis can identify charts from their bar codes and check that you have a correct OBC chart before reading it in. Once identified, the chart is scanned. Each row of patches is scanned twice, once with visible light and once with a UV light source. The two photos below are taken looking into the scanner slot as the end of a sheet goes into it. The first picture shows the bright white light used for patch reading, whilst the shot below shows the UV source. There is something visible in the second picture for two reasons. Firstly my camera is more sensitive to UV than my eyes and secondly the OBAs in the paper are fluorescing slightly in the UV. I’ve picked a very white matte paper here to test. The OBA content is high enough to be quite obvious when you take the paper near a window, compared to papers I’d more commonly use for my printing. Once the measurement is complete, the software will use the readings to create a custom grey chart. There are different versions if you are using glossy or matte paper. The chart is saved as a Tiff file. The file needs to be printed using exactly the same print settings as used for the main profiling chart. At first sight, the chart produced doesn’t look very grey at all. The important thing to remember is that this chart is printed without any colour management. I was testing this particular paper on my old Epson 9600, which takes quite a bit more ‘working’ in profiles to get optimal results. A newer printer should produce a chart that looks much more grey. The photograph below shows what was actually printed. 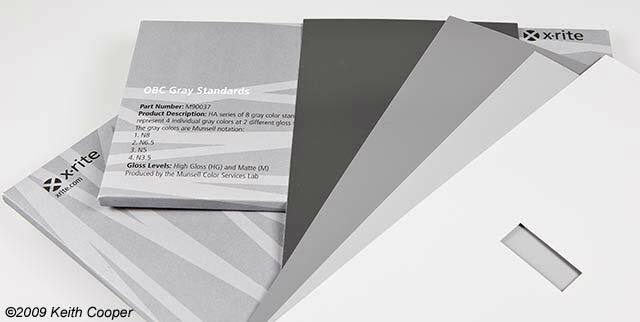 The grey test sheets are accurate neutral greys and have their Munsell values printed on the back. This first example was taken using the cold fluorescent lighting panels I sometimes use for detailed product photography (~4600K). The RAW image from the camera (a Canon 1Ds Mk3) was grey balanced in Adobe Camera Raw from the test card itself. I’ve boosted saturation by about 10% to show the slight variations in grey tint. The measurement process relies on you moving the window up and down the appropriate column to decide which patch matches the best. The effect is most likely to be noticed in the light grey patches. Darker patches were not easy to tell apart, but patch ‘A’ on each was probably the best. Such low values either indicate that either little OBAs are present, or there is little UV in the light source. The next examples are illuminated from a north facing skylight on a cloudy day. One again I’ve white balanced the image from the plastic card. The blueness of the paper is quite noticeable, and I’ve had to go to patch ‘G’ to get a match. These shots have both had colour saturation turned up slightly to try and show the effect in web images. The image below clearly shows that the second column is showing up a noticeable brightening of the paper too. There is a sheet of protective tissue paper at the right – you can see how blue the test paper is in comparison. Do remember that in the images here, you are looking at camera images, compressed as JPEGs for web use – the colours are aimed at showing how the test looked, rather than for any photometric accuracy. You can see the higher values in this light, after I’d checked all greys. Upon completing this stage, you save a new modified set of the original measured chart values. This set is used for building your profile in PMP. You should be careful that additional OBA correction is not enabled when creating profiles, since this would mess up the whole profile generation process. A very simple process that allows you to produce profiles that give noticeably better prints, in particular lighting conditions. If you wanted, you could produce profiles that are optimised for viewing prints at a particular location. Of course, the effect is lessened if there are few (or no) OBAs in your paper, and many fine art printers go out of their way to avoid OBAs. Since Northlight Images produces and supplies prints for commercial locations, as well as our ‘fine art’ clients, the OBC module is a useful addition to the profiling toolbox. Since we’re using Profilemaker Pro to make our profiles, it should be noted that if you provide it with non UVCut spectral data from the iSis, it will detect large amounts of OBAs and offer the option of compensating, when profile building. This helps, but unlike the approach here is not based on any final viewing conditions. There are a few issues with OBC though, particularly in regards to the OBC workflow. Let’s say I print a set of patches for a profile, measure them and create a profile. Normally I could save the measurement data and if I needed to produce a specialist profile at a later date (say for tungsten lighting), then I could re-use the measurement data to make the new profile. 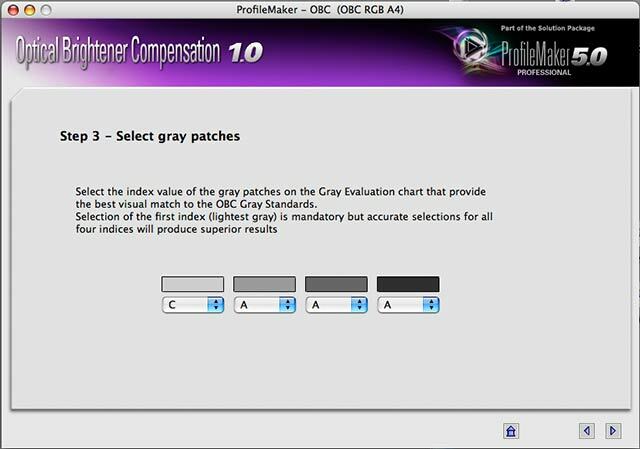 If however, I measure the chart and generate a set of grey patches to make an OBC profile, then I have no data stored anywhere to go back and reprocess. If I want to make a second OBC profile, I have to go back to the original chart, measure it again and repeat the whole process. A bit of a nuisance if I haven’t kept the original chart, even more if it’s a year or so on. The limitations of workflow also apply if I wanted to make a suite of profiles covering different lighting conditions. 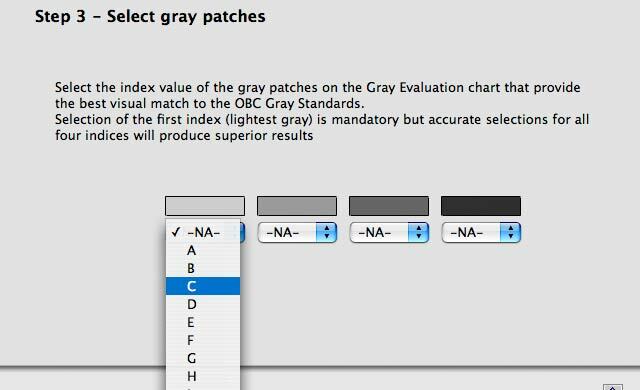 Rather than just take the greys chart with me and record the adjustment values, I’ve got to start from a new chart measurement (and grey patch creation) each time. There is also a limit on initial chart choice, in that the chart source data must reside in the OBC application. I’d normally use an A3 test chart, but for the RGB profiling I wanted, was limited to an A4 page. In addition, for some papers I like to take a series of measurements and average them, using the PMP MeasureTool – this option is not available. I’ve heard it said that it’s a problem that this approach relies on visual matching, although I found no difficulties myself. Whilst I’m sure that more complex measurement devices could automate the process, I found no difficulty in using the OBC module myself. For this article I was testing a paper that is just too blue/white for my own tastes – I’d been given a box of it to test a few months ago, and found that the profile I’d built, didn’t give particularly good results with much daylight around. The OBC version makes for a much more usable profile – but I still don’t much like the paper. The OBC module is probably of more regular use to those those printers that do use high OBA papers for commercial applications. 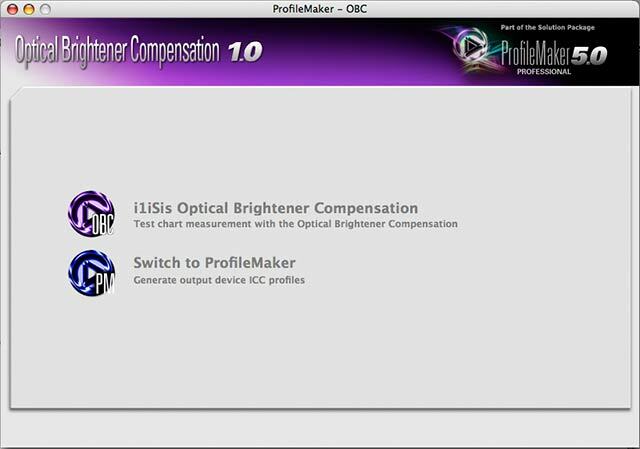 Additional software module for ProfileMaker Pro and/or Monaco Profiler to allow profiles to be built that compensate (to some extent) for Optical Brightening Agents in papers. Easy to use for one off profiles, although currently a bit awkward to use for some applications.